Selecting great places for the collection of sweet memories of life is a great move. We all want a home where our all family members can feel relaxed and enjoy the most exciting modern comforts and facilities. 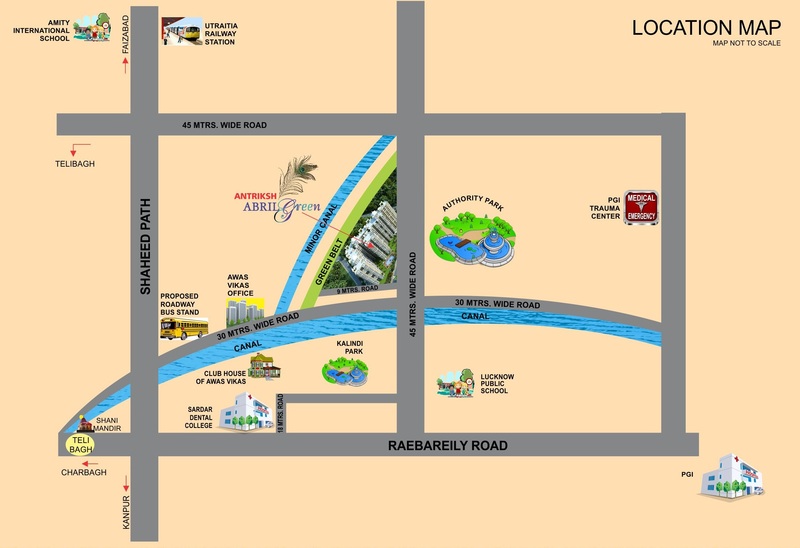 In search of wonderful luxury homes, maybe most of you have visited several outstanding residential properties in Lucknow city and if you still are unable to find the perfect place or have doubts in your mind due to its high prices or lack of luxury features and specifications, please consider Antriksh Abril Green where everything has been placed for the perfection only. The project will release possession for its tremendous range of 2 and 3 BHK modern apartments in December 2021 for which new bookings are currently open and you can select from the Antriksh Abril Green Price ranging from INR 33.99 lakhs to Rs. 52.17 lakhs. Buyers can choose different sizes available here which are ranging from 1000 sq. ft. to 1535 sq. ft. The apartments available in this residential development are very glorious and are beautifully designed by internationally renowned architects. The brilliant floor planning and spacious interiors here provide magnificent charm to these modern homes. All the Vaastu principles and guidelines have been properly followed here in the construction. Designed over RCC framed structures, these homes are earthquake resistant and are completely air-conditioned with VRV and VRF technologies. The project has been rewarded with a green building certificate as there are overwhelming green zones here for leisure walk and magnificent nature views. There are ample natural light and complete ventilation in these apartments as the wide and spacious balconies available here also provide magnificent views of garden areas. There are modular kitchens with granite top and other essential provisions required for a great cooking experience. The sophisticated bedrooms here have wooden tiles and wonderful plastic paint emulsions. All the items used in sanitary wares, furnishing and fittings are of the supreme quality. The project has been strategically located in Vrindavan Yojna and so Antriksh Abril Green Lucknow has the proximity to several renowned IT parks and major commercial zones in the city. From the complex, residents can travel smoothly to all the major landmarks in the city. The transportation system is very active and smooth here and available on quick and regular intervals. Accessibility from here to the nearest schools, banks, departmental stores, shopping destinations, cinema halls, restaurants, chemists etc. is very quick and smooth. Your decision of selecting an apartment in Antriksh Abril Green Vrindavan Yojna, will prove as your wisest decision as there are great features and specifications available here for each of your family members. Some useful amenities and modern facilities that are providing here to the customers can be enumerated as an air-conditioned guest room, high-tech control room, sewage treatment plant, video security, swimming pool, clubhouse, meditation centre, indoor games, kids’ play area, gym, landscaped garden, intercom, constant water and power supply, restaurant, Wi-Fi connectivity, ample space for car parking and much more. For a prosperous lifestyle, visit here and feel the difference. The glorious project is the perfect destination for all modern housing requirements.